A facing of stone or brick is frequently used for reinforced concrete, and is a very satisfactory solution of the problem of finish. The same care is required with a stone or brick facing as if the entire structure were stone or brick. The Ingalls Building at Cincinnati, Ohio, 16 stories, is veneered on the outside with marble to a height of three stories, and with brick and terra-cotta above the third story. Exclusive of the facing, the wall is 8 inches thick. In constructing the Harvard University Stadium, care was taken, after the concrete was placed in the forms, to force the stones back from the face and permit the mortar to cover every stone. 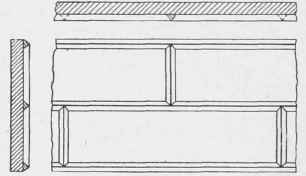 When the forms were removed, the surface was picked with a tool as shown in Fig. 118. A pneumatic tool has also been adopted for this purpose. The number of square feet to be picked per day, depends on the hardness of the concrete. If the picking is performed by hand, it is done by a common laborer; and he is expected to cover, on an average, about 50 square feet per day of ten hours. With a pneumatic tool, a man would cover from 400 to 500 square feet per day. Fig. 117. Masonry Facing of Concrete.